Temple Isaiah is fortunate enough to have one of the most active youth communities in the Greater Boston Area. Within our community, we aspire to create a home for “young people [who] will be empowered as Jews on a personal level, as members of the Jewish community and as citizens of the world.” We hope to teach our teens that Judaism can be a part of their everyday lives and that Judaism is a living, breathing religion that relates to everything they do as teens and everything they will do as adults. We make every effort to teach our teens how important it is for them to be proud Jews who value, honor and respect themselves, each other, their community, and beyond. With that said, we know that we cannot do any of this without you so thank you for being a part of our community and for helping us keep our Jewish tradition alive! Are you a teen or a parent of a teen? If you would like to receive our weekly email newsletter with the latest updated information about our events, send the school office your name and email address. Note: You do not have to be enrolled in any of our programs to receive this info! 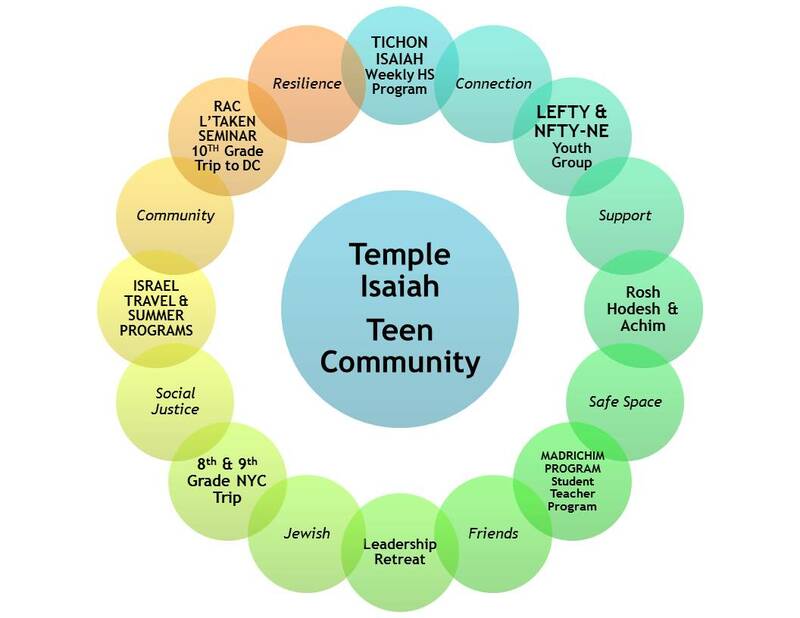 Please feel free to look around our website to learn more about Temple Isaiah's Youth Community.